When a young man set himself aflame on a street in the Tunisian town of Sidi Bouzid, his cry of anguish at the hardship of life under a stifling autocracy echoed across the region. Within weeks, his protest had sparked a full-blown people-power revolution that spread quickly throughout the Middle East. Nowhere were its effects more dramatic than in Egypt, the most populous country in the Arab world and its cultural epicenter. The regime of President Hosni Mubarak, backed by considerable aid from the U.S., had held sway for three decades and entrenched itself in all corners of Egyptian society. But the spectacle of Tunisians ousting their long-ruling President, Zine el Abidine Ben Ali, gave courage to myriad Egyptian dissident groups. 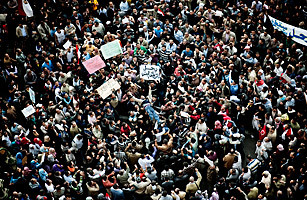 Through social media and the Internet, protesters organized a Day of Revolt on Jan. 25, with tens of thousands taking to the streets against Mubarak. Cairo's Tahrir Square  once a pedestrian-unfriendly traffic circle  became the locus of protest and symbolic home of the revolution. In a matter of weeks, a regime that for so long seemed invincible simply unraveled; authorities announced Mubarak's departure on Feb. 11. He's now on trial, at the order of the interim military government, on corruption charges and for the brutal crackdown by state security forces that led to the deaths of nearly 1,000 protesters. Egypt held its first democratic elections Nov. 27, but its struggles are far from over: for weeks ahead of the vote, thousands massed at Tahrir Square yet again, voicing their disquiet with the military's dubious commitment to real democracy. With Egypt's Islamist parties buoyed by a strong showing in the Nov. 27 vote, the struggle for power only grows trickier.